In this issue of India Briefing Magazine, we look at India’s living and working environment, HR and payroll laws, and the taxation norms as applicable to foreign nationals. India is the second most favored destination for expatriates that want to work in the emerging markets. Expatriates should take note of the basic social and welfare concerns – such as accommodation, business culture, healthcare, and education facilities – as well as the regulatory and tax issues that apply to foreigners that work in the country. India is the second most favored destination for expatriates that want to work in the emerging markets. Over the past few years, India’s rapidly growing infrastructure, industry, and services sectors have opened up its economy to greater foreign investments and multinational corporations. This development has led to numerous employment opportunities for foreign nationals working in skilled and specialized roles in the country. Accordingly, the sectors in India that attract the largest number of foreign professionals are the construction and engineering sector, followed by telecommunications and IT, and financial services. As greater foreign funding has resulted in hiring of foreign expertise, India’s living and working environments have also adapted to global cultural standards. This is particularly so in its Tier-I metropolitan cities, where Special Economic Zones, industrial and software parks, as well as corporate centers have created conditions conducive to new jobs with an international profile. In this edition of the India Briefing Magazine, we look at India’s living and working environment, HR and payroll laws, and the taxation norms as applicable to foreign nationals. We define basic social and welfare concerns – such as accommodation, business culture, healthcare, and education facilities – as well as regulatory and tax issues that apply to foreigners that work in the country. Dezan Shira & Associates growing team of specialists diligently monitors these factors to support our international clientele. 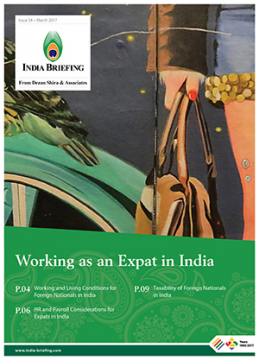 This issue of India Briefing will inform readers about what makes India an attractive expat destination, in terms of its quality of life, working conditions, and improving tax and payroll norms.